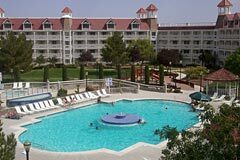 Primm Valley Resorts, located just 35 minutes from the Las Vegas Strip, provides 3 distinctive resort experiences in Buffalo Bill's Resort and Casino, Primm Valley Resort and Casino, and Whiskey Pete's Resort and Casino. All three are linked through tram and bus transportation, complimentary for guests and visitors. Each property features a variety of accommodations ranging from standard guest rooms to expansive suites, and all feature full casinos, a great selection of restaurants, swimming pools and numerous amenities. 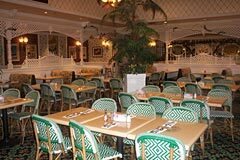 There is an upscale outlet shopping mall, spacious conference center, and the Star of the Desert Arena plus Whiskey Pete's Showroom for large gatherings and events. 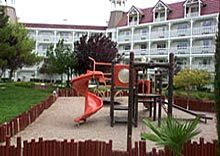 Primadonna's RV Village is also part of the resort. 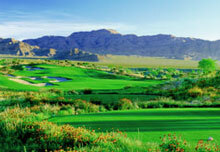 Golfers will be interested to know that The Primm Valley Golf Club is 5 minutes away, providing 36 holes of Tom Fazio designed championship golf, with the 4 ½ star Lakes and Desert Courses earning recognition in the Top 100 Courses You Can Play in the North America (Golf Magazine). From the generous rolling fairways and sparkling water accents of the Lakes Course (6950 yards par 71) to the stunning beauty and challenging natural terrain of the Desert Course (7131 yards par 72), a great golf game is just a swing away. 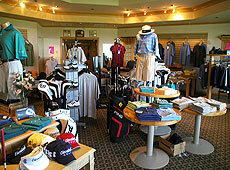 Both courses are serviced by a beautiful clubhouse that features a pro shop stocked with accessories and golf wear, locker rooms with showers, and a full service lounge and restaurant with outdoor patio featuring spectacular views. Practice facilities include 2 large putting greens, an expansive double ended grass driving range, and one of the most complete short game areas we have experienced. 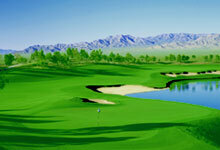 The two courses are among the best the Vegas Valley has to offer, and each layout is noticeably unique. The conditioning from tee to green is extra-ordinarily exceptional. Two separate, raised greens are supplemented with sand bunkers and chipping and pitching areas that allow for practice shots from up to 80 yards away (when not overly busy, of course). 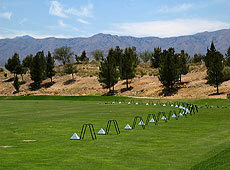 This area, and range balls are complimentary with paid green fees. 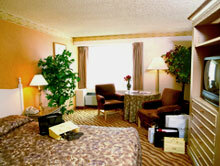 1,242 luxury guest rooms and suites in two towers, with warm color schemes creating a comfortable and relaxing western escape. 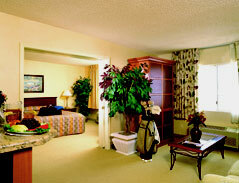 Suites feature wet bars, adjoining parlors with privacy doors and Jacuzzi tubs. Desperado Roller Coaster (over 1 mile in length) along with other attractions including the Turbo Drop, Max Flight 2002 Virtual Roller coaster, and the Adventure Canyon Flume Ride. 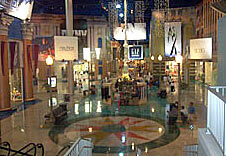 The Primm Center, located between the three casino hotels, is not an ordinary convenience store. This 9,000 square foot facility provides 30 self service fuel stations, spacious restrooms, and an array of favorite snacks, beverages and "road food". The 21,000 square feet of ballroom space can be divided up into 14 different spaces ranging from 323 to 8,000 square feet - all within walking distance of 10 incredible dining establishments, 24-hour Vegas style gaming, hundreds of comfortable rooms and luxury suites, and a variety of entertainment and recreational options including, of course - GOLF! 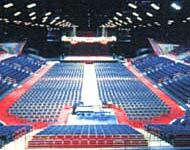 The 6,000-seat Star of the Desert Arena at Buffalo Bill's, besides hosting an array of concerts and special events, is also accommodating to large groups for conventions and Conferences. 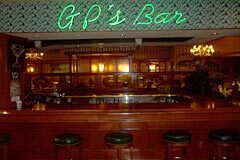 The same is true of the 700-seat auditorium at Whiskey Pete's. 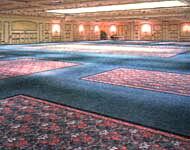 For big or small events, the 21,000 square foot Primm Valley Conference center is the ideal venue. Catering, entertainment and refreshments can be handled by a professionally trained staff, and paper work is a breeze in the full-service Business Center. Click here to visit our web catalog of Vegas area golf courses - which includes informational pages on the Desert and Lakes golf courses. 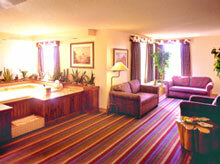 Resorts are located just 35 miles south of Las Vegas on I-15 at the California/Nevada state line.